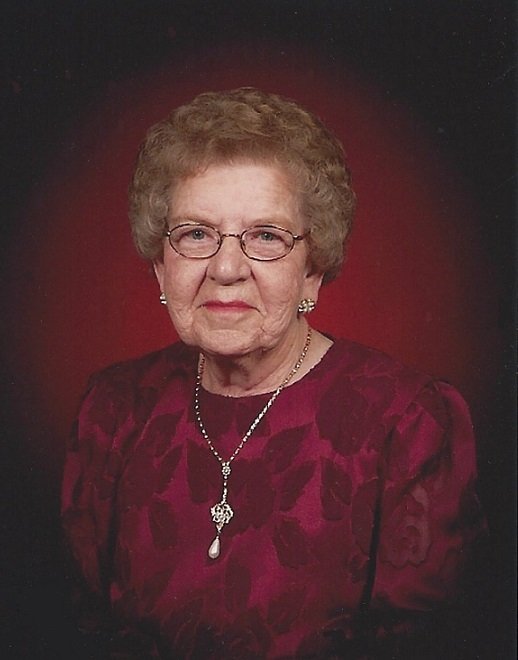 Viola Robben, age 92, from Walker, Kansas died Monday, December 3, 2018, at Brookdale Assisted Living – Hays. She was born May 26, 1926, on a farm South of Ogallah, Kansas to Michael and Anna (Sander) Hammerschmidt. She married Wilfred Robben on January 28, 1947, at Victoria, Kansas. He preceded her in death on August 23, 2002. She was a homemaker and a farmer’s wife. She was a member of St. Ann’s Catholic Church, St. Ann’s Christian Mothers both of Walker, Kansas and St. Fidelis Daughters of Isabella, Victoria, Kansas. Her family moved in 1938 from Ogallah to Victoria where she attended school. She enjoyed playing cards, cooking, quilting, embroidering, her family and friends. Survivors include three sons, Leroy Robben and wife, Karen, Melvin Robben and wife, Patty, both of Salina, KS; Norman Robben and wife, Linda, Walker, KS; seven grandchildren, Jason Robben and fiancé, Julie Richmeier-Werth; Jackie Vestal (Brandon); Christina Sramek (Ryan); Jamie Robben; Aaron Robben (Ashley); Daniel Robben (Kara); Patrick Robben (Amanda); nine great grandchildren and one on the way; one brother, Elias Hammerschmidt, Wichita, KS; two sisters-in-law, Bernice Hammerschmidt, Hays. KS and Agnes Hammerschmidt, Hutchinson, Ks. She was preceded in death by her parents; husband; one son and daughter-in-law, James and Jane Robben; one great grandson, Landry Robben; five brothers, Fridolin, Richard, Norbert ,Alvin and Elmer Hammerschmidt; five sisters, Silvina Pfaff; Sister Armella Hammerschmidt C.S.A. ; Helen Mohl; Mary Weigel and Irene Pfannenstiel. A St. Ann’s Christian Mothers and St. Fidelis Daughters of Isabella combined rosary will be at 7:30 P.M. Wednesday, followed by a vigil service at 8:00 P.M. Wednesday, all at Cline’s-Keithley Mortuary, 412 Main Street, Victoria, Kansas 67671. Visitation is from 6:00 to 9:00 P.M. Wednesday, at Cline’s-Keithley Mortuary Victoria, Kansas and from 9:00 to 10:00 A.M. Thursday, at St. Ann’s Catholic Church, Walker, Kansas. Memorial to St. Ann’s Cemetery, Walker, Kansas. Condolence can be left by guestbook at www.keithleyfuneralchapels.com or can be sent via e-mail to clinesmortuary@eaglecom.net. | 400 E. 17th St.